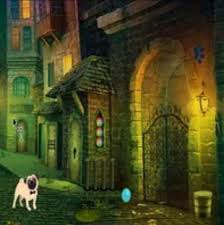 8b Dog Street Escape is another point & click escape game developed by 8bGames. Imagine that you moved to new city. As it’s a new place, you started walking at night to get fresh air. While you were walking, you lost track and the road ended up in a dog street. Find some hidden objects and clues and solve some interesting puzzles to escape from the dog street. Good luck and have fun! or mayhaps just the same breed...? prints on bowls & Co.
ty Nafanja! I was so lost in that letter grid! Colorful on the caps and bows of dogs. I'm stuck there for a while too, Carm C.
where does the bone go? hi, what is the clue for 4#code in third cupboard? hotz the clue will come after placing all 4 bones, my last one was on window in street top of the dog.